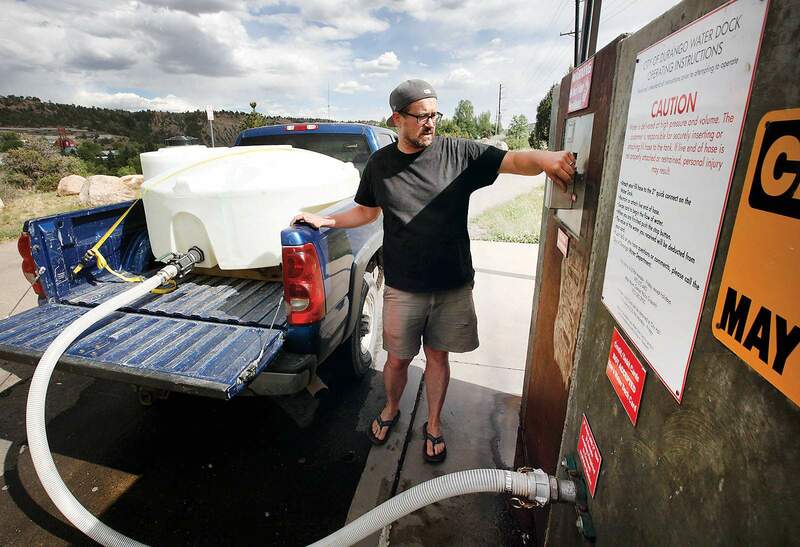 Eric Kiefer fills up a water tank Wednesday at the city of Durango’s water dock near Bodo Industrial Park. The city is no longer accepting new water dock customers because of the drought conditions. La Plata County residents who need potable water during the summer drought will need to find it somewhere other than the city of Durango, unless they are already water dock customers. The city stopped accepting new water dock customers about two weeks ago, saying if it takes on more clientele during the drought, it may have to institute water restrictions earlier, said Jarrod Biggs, assistant utilities director. La Plata County is currently in an “exceptional drought,” the most critical drought listing by the U.S. Drought Monitor. “We are balancing our supply and demand at this point in time,” Biggs said. Some La Plata County residents are already reporting their wells going dry. The city’s current water dock users have consumed on average 3.87 million gallons of water annually over the last three years, he said. The city’s water use ranges from about 3.2 million to 3.9 million gallons per day on average, according to annual audits. The city issues customers cards to purchase water at the dock and has 1,223 active cards, he said. County resident Mark Condiotti said he recently attempted to buy water from the city but was told at Durango City Hall he would need to travel to Bayfield or Ignacio to purchase bulk water. “They are restricting water from people who need it,” he said. The city of Durango isn’t the only water dock owner considering how to handle the drought. Bayfield could have to tap into its water reserves in Vallecito Lake this summer, which could prompt more water restriction measures for its customers, Town Manager Chris LeMay said. The town already requires residents to water every other day and prohibits them from watering during the day, he said. The town has seen an increase in consumption at its water dock since February, and the town might consider staffing the water dock to limit consumption. “Our first-priority customers are residents and the businesses in the town of Bayfield,” he said. The town would have to staff the dock, because the town’s water sales are cash-based, and there is no automated way to limit sales, he said. Water dock sales are about 5 percent of the town’s water consumption. The La Plata Archuleta Water District operates a water dock south of Oxford and does not expect to limit sales, General Manager Ed Tolen said. “We believe we have sufficient water to make it through the summer,” he said. The district serves 195 water dock accounts and has sold 386,000 gallons this month, he said. Demand for the district’s water has risen in recent months, a trend he expects to continue. If necessary, the district could limit how much water customers are able to purchase each month through an automated system, he said. The Southern Ute Indian Tribe, which sells water at docks in Ignacio, did not respond to an email Wednesday seeking comment. In western La Plata County, some residents are still purchasing water from the Marvel spring, resident Pat Greer said. However, the long-time rancher said he does not expect the natural water supply to last because of the drought. “There is nothing growing out here except a few acres of Alfalfa,” he said. Residents in that area could travel to Aztec, Farmington or Mancos to purchase water from docks, he said.